There was home hurt for Stornoway Rugby Club’s under-15 lads who went down to a heavy defeat at Bayhead against Aberdeen Grammar Rugby Club. Stornoway’s teen stars rolled out the green carpet for their guests in what was a double header for both the league and the first round of the Caledonia U15 cup. After poor weather the night before it all cleared up to give the boys a great day to play rugby on home turf. The game started brightly with good running rugby being displayed with strong rucking and tackling also being evident from both sides. Grammar scored their first of six tries after about 10 minutes when their captain, number 8, who was also their man of the match made a strong run from the base of the scrum to score in the left hand corner. The game continued at a good free flowing pace with excellent attacks from both sides during the first half however, grammar scored two more tries to make the half time score 17-0. 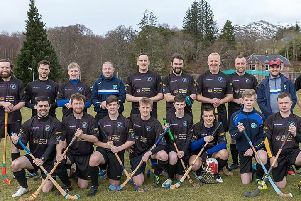 A couple of changes were made at half time to the Stornoway pack which gave the side more more parity in the set piece, due to the physical encounter within a space of about 10 minutes Stornoway lost both centres and their left wing to injury. After a quick reshuffle the boys got straight back in to it showing determined defence however, the Stornoway attack was limited due to the excellent Grammar defence. As the game came to a close, the Stornoway side had unfortunately lost another three tries which made the final score 34-0. Stornoway U15 coach Iain McFee praised the efforts of his team who had been without a fixture since last November. He said: “We were up against a strong unit that play rugby matches every weekend and this was the key factor between the sides as the Grammar pack had the upper hand in the set piece. “I am very proud of the effort that was put out on the pitch today and special credit has to go to the S2 boys that came in to support and did an excellent job from the bench.